AKA Walter Leland Cronkite, Jr.
Long before there were 24-hour news networks, when there were only three commercial broadcast networks, Walter Cronkite anchored The CBS Evening News for two decades. 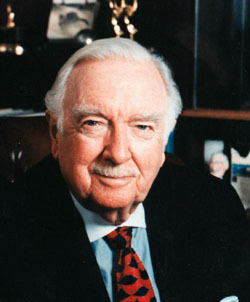 It was television's most watched newscast, and Cronkite's dead-serious demeanor earned his reputation as "the most trusted man in America". In the decades before blow-dried hairdos and airhead banter redefined TV news, Cronkite was the real deal: a genuine reporter. As a boy, he worked in a newsstand selling newspapers. As a young man, he studied journalism at the University of Texas, and wrote for the school's Daily Texan newspaper. He dropped out of college in his junior year to take a job as a full-time reporter for The Houston Press, and later he wrote for Scripps-Howard and United Press International. With UPI, Cronkite covered World War II from North Africa and Europe. He filed reports from the scene of D-Day, flew on U.S. World War II bombing missions over Germany, and covered Germany's surrender. After the war, he covered the Nazi trials at Nuremberg. In 1950, he went to work for the CBS affiliate in Washington DC, and soon he was hired by the network. He anchored You Are There, where historical events were dramatized and 'covered' as breaking news, and narrated network documentaries, back when CBS used to do serious news documentaries. When Cronkite took over The CBS Evening News in 1962, the newscast was just 15 minutes long, but he soon oversaw its extension to a half hour. For several years Cronkite's ratings trailed NBC's Chet Huntley-David Brinkley news duo, but CBS took the lead in 1967, and held the audience until Cronkite's retirement in 1981. For most Americans, it was Cronkite who told them when Neil Armstrong walked on the moon, when Watergate became more than a trivial burglary, and when Richard M. Nixon resigned. Some say Cronkite's coverage of the Vietnam War hastened America's exit from that grand mistake. After visiting Vietnam to report on the Tet offensive, Cronkite broke from his usual impartiality to editorialize that, from his perspective, the war seemed "unwinnable". President Lyndon B. Johnson, watching the telecast, reportedly turned to an aide and said, "If I've lost Cronkite, I've lost middle America". While Cronkite was the face of The CBS Evening News, his network was on very friendly terms with the Central Intelligence Agency. In a 1977 article in Rolling Stone, Carl Bernstein reported that CIA Director Allen W. Dulles had long relied on CBS president William S. Paley. "Over the years", Bernstein reported, CBS "provided cover for CIA employees, including at least one well-known foreign correspondent and several stringers; it supplied outtakes of news film to the CIA; established a formal channel of communications between the Washington bureau chief and the agency; and allowed reports by CBS correspondents to the Washington and New York newsrooms to be routinely monitored by the CIA". In 1976, ABC newsman Sam Jaffe reported seeing Cronkite's name on a White House list of reporters who had worked for the CIA. Cronkite angrily denied the accusation, and confronted then-CIA director George H.W. Bush, demanding that Bush name any CBS staffers who had actually been CIA operatives. Bush, of course, would not name names, but a week later, Cronkite's newscast reported that at least two former CBS reporters had secretly worked for the spy agency. Ironically, CIA officials later claimed that Jaffe himself had "performed clandestine tasks" for the CIA. And beyond Jaffe's claim, there's no evidence Cronkite was ever a spook. Cronkite's signature was ending each newscast with the phrase, "And that's the way it is". In 2006, in his last work for CBS News, Cronkite recorded a voice-over introducing the The CBS Evening News with Katie Couric. In January 2010, about six months after his death, Cronkite's taped introduction was dropped from the network's newscast, and replaced with a more dramatic voiceover read by actor Morgan Freeman.